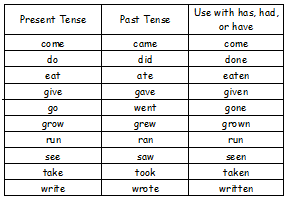 The verbs come, do, eat, give, go, grow, run, see, take, and write have special spellings to show past tense. These verbs may also have other spellings when they are used with has, had, or have. ex. A mouse had gone into our house. The mouse ran into the woods yesterday. My mother gave me a chapter bok about dogs. The author has written books about other animals.